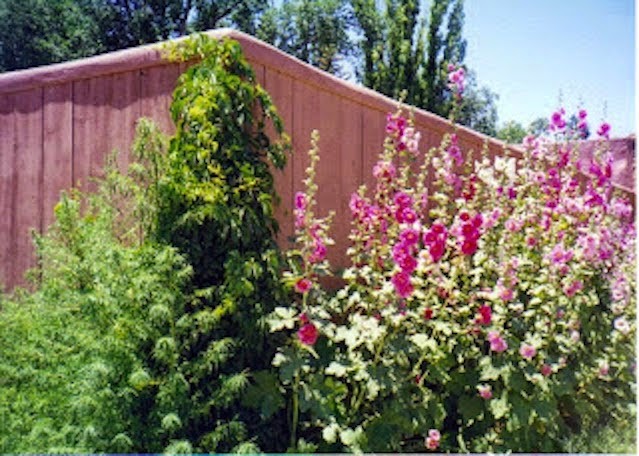 Some years ago on our first trip to New Mexico, we saw these hollyhocks blooming in the little town of Cerrillos along the Turquoise Trail that runs between Albuquerque and Santa Fe. 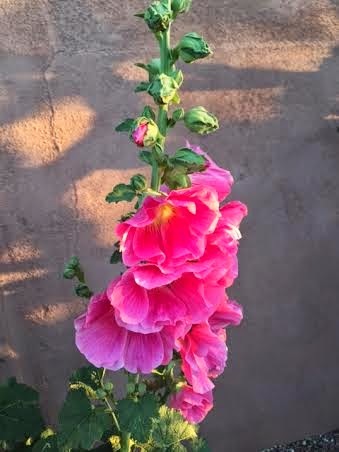 I never forgot the sight and hoped to have some hollyhocks of my own someday. I feel so lucky that my wish came true. 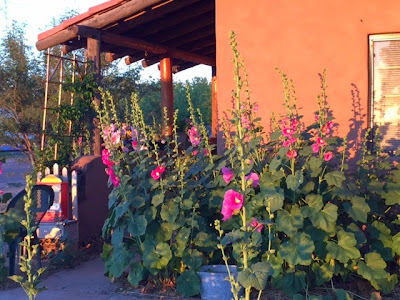 We not only have our hollyhocks, but we also have some warm adobe walls to give us shelter and to act as a background for our flowers. All of these hollyhocks and the ones out in the back of the house are descendants from a little handful of seeds given to me by my knitting friend, Diane. That was maybe four years ago. 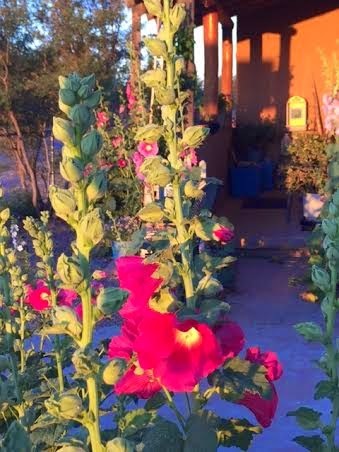 Many of you who are reading this have received seeds in the mail from me; relatives of these hollyhocks are growing all around New Mexico and in Arizona, California, Massachusetts, New Hampshire, Oregon, Texas, and Virginia. 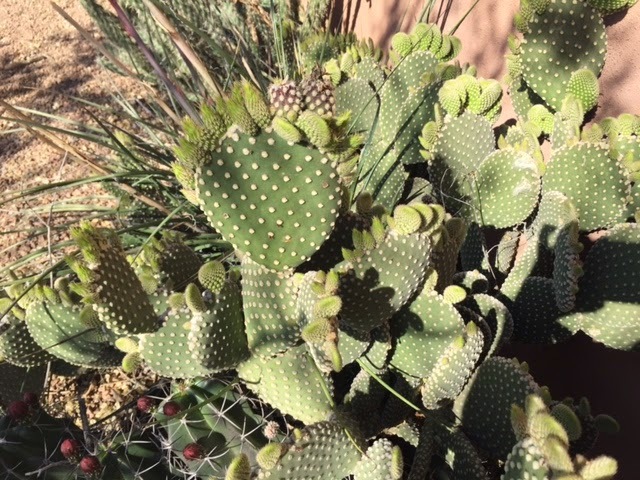 The original plants from the first year have spread and spread. Little seedlings spring up in unusual places. Sometimes I move them to a better spot, and sometimes I just let nature take its course. 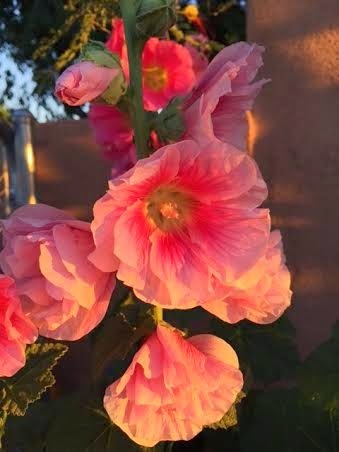 The new hollyhocks fill in empty spots where I haven't been able to grow other plants. They don't seem to care if I forget to water them, although they do appreciate every drop they get. 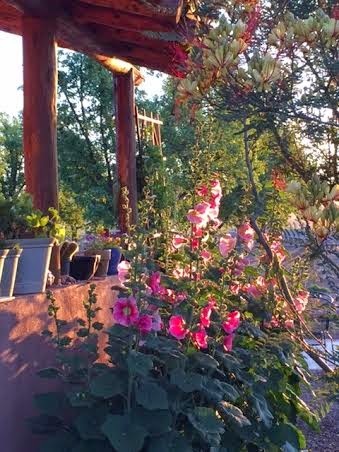 The flowers catch the early morning light in a way that makes my heart glad. It is very hard to capture that with my little cell phone camera. 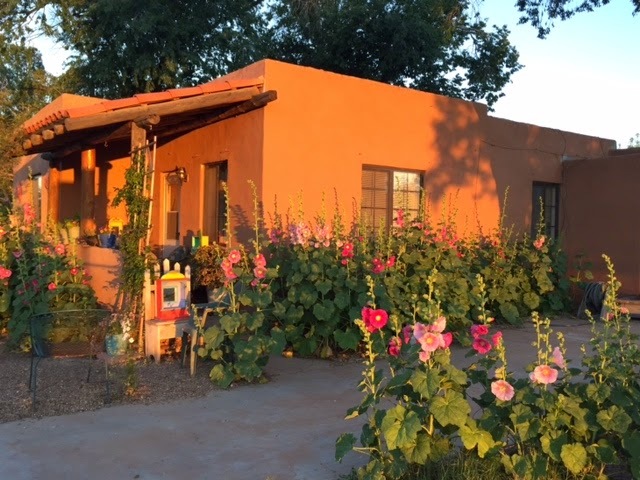 It feels to me that this colorful garden is a culmination of a lifetime of hard work and planning--not planning for flowers, but for retirement and a place to live in the sun. 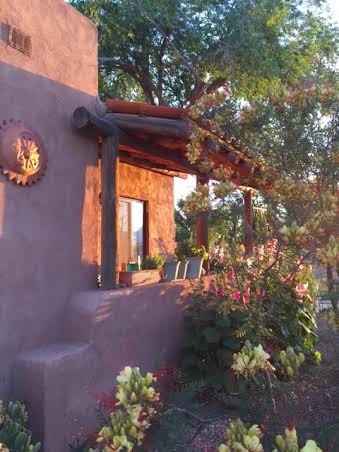 The flowers just make this part of our lives even more lovely. 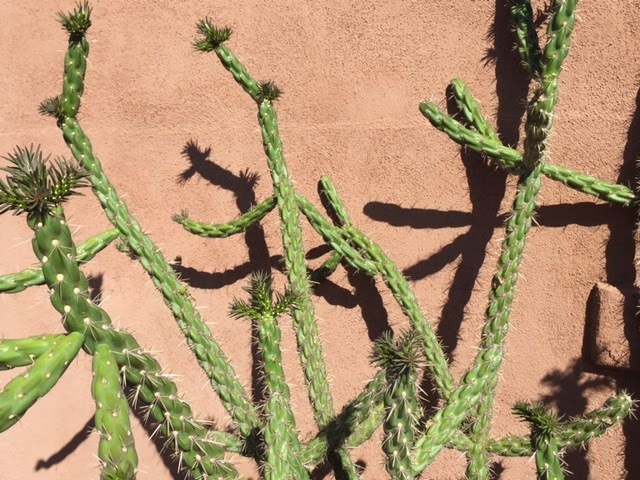 Are You Ready For Some Cactus? 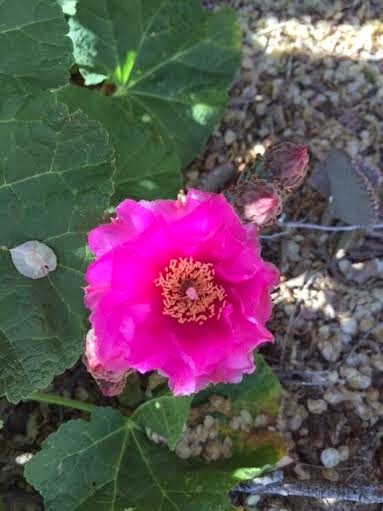 Springtime is just as exciting in the high desert as it is anywhere else. It's just--well, different. The pale pastels I was used to in New England--daffodil yellows, crocus pinks, soft lilac lavenders--are replaced by the pastels of the landscape itself. Apparently this new Spring style has been growing on me over the years and I've just realized that I would miss the sun-washed (washed out, truth be told) colors of springtime here--the pale blue shades of the sky; the soft greens of the budding trees in the river valley; and, yes, the pale adobe brown of the little houses and of the wind-driven dust storms. Springtime means growth in the garden, of course. 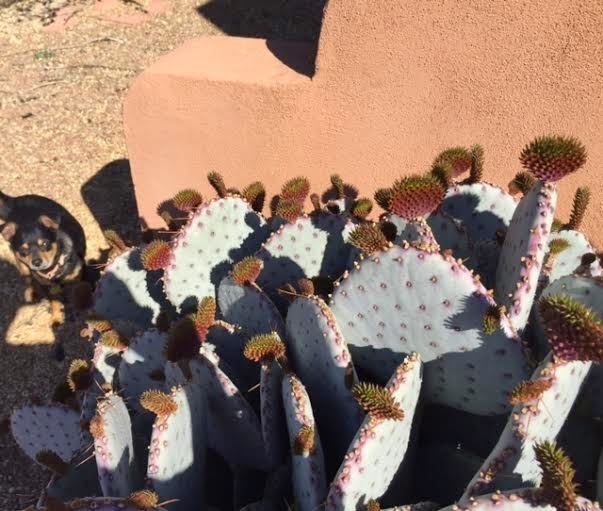 Here are some of the stars of our blazing hot southern-facing front yard. 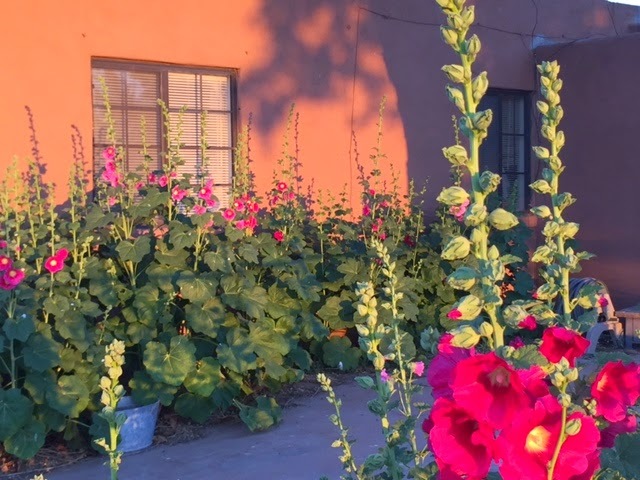 The roses that I blithely planted, all nestled up against the adobe walls (knowing that they always appreciated a warm wall in New Hampshire) have long since dried up and given up the ghost; but the cacti are thriving. Lesson learned, Yankee transplant! Detail, new pad coming out. for getting its little almost-invisible needles stuck in you. and yours, too) telling how to remove them from your skin. 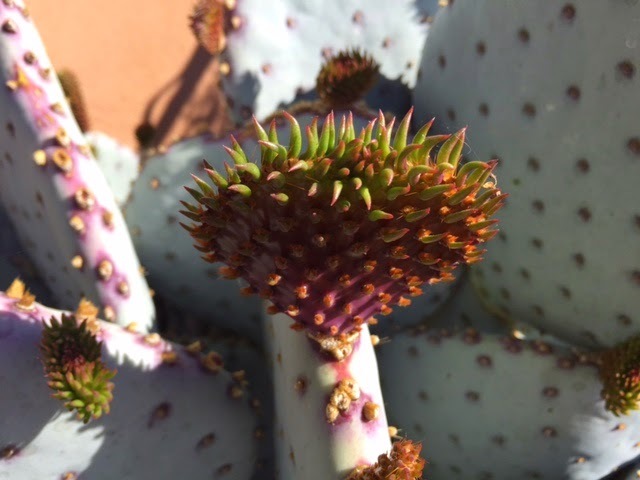 The center of this plant matured and died away a couple of years ago and now its descendants are coming to life. 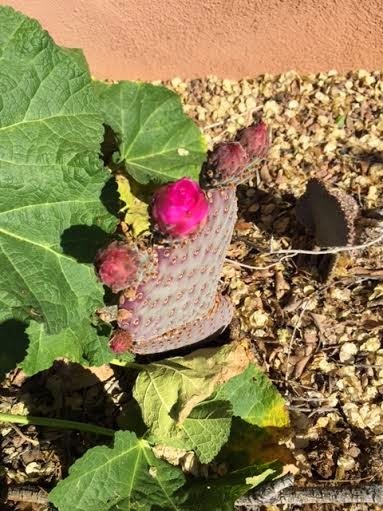 That's a hollyhock leaf trying to shade the little cactus--more about hollyhocks in a later post.